Last week, I wrote a blog post about Tweeting Jigyo-Shiwake". As I was busy with various works, I was not able to stay home and watch Jigyo Shiwake the whole 4 days, but asked on Twitter for others to help out. I would like to thank everyone who helped, especially @MMHero who was devoting much of his time during the 4 days. Personally, I think it is better to blog than tweet for this, since non-Japanese people would need explanation on technical terms and Japanese political custom (such as Amakudari etc) , but I think this was a good experiment. I was watching many of the sessions and there was 1 thing that is common to most of the sessions, which is Amakudari. 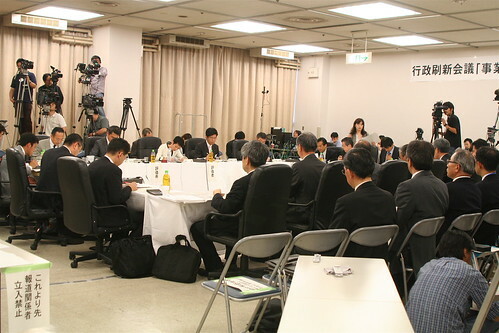 Amakudari (天下り) is the institutionalised practice where Japanese senior bureaucrats retire to high-profile positions in the private and public sectors. The practice is increasingly viewed as corrupt and a drag on unfastening the ties between private sector and state which prevent economic and political reforms. Jigyo shiwake is about cost cutting, and when they try to do cost cutting on any public sector, the big chunk of money dangling in front of the shiwake-nin is the huge cost of Amakudari people. Japanese companies were based on seniority system till recently too, but the economic situation no longer allows such thing. You need outputs to get promoted in most Japanese corporate entities now. However, public sectors still have seniority system and the older you are, the higher your position (and salary) you get. "Career" are the people who passed higher level exam for the National Public Service(国家公務員試験の上級甲種またはI種), and are promised to be executives in the future. "Non-Career" people are people who passed the exam for National Public Service, but not with the higher level one. "Non-Career" will not be promoted above unit head. A Non-Career I met recently told me that she is really discriminated by the "Careers". So when the Career people get old are ready to retire, they get plenty of retirement bonus from the agency, and the Seniority System and Career System secures them "posts" in public and private sectors with high salary, with not much work to do. That is how "Amakudari" works. 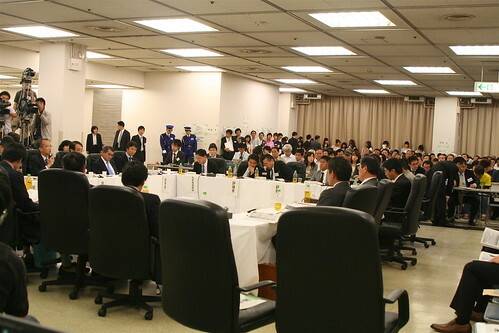 In most sessions of the shiwake I watched, shiwake-nin would ask how many board members they have, and how many of them are Amakudari, and how much their salary was. Each time the reply was given, Twitter chat on Ustream would go mad as their salaries are around 12 million - 16 million yen, when average salary of the citizens are male: 5.3 million and female: 2.7 million. "Fire those Amakudari and hire more younger people who does the actual work!" Twitter users say. Totally. Now that we are getting a clearer view of the cost of Amakudari, I am hoping that the Government Revitalization Unit will actually take action to abolish Amakudari. (Government Revitalization Unit is responsible for government reform as well as Jigyo Shiwake). Hand-written shiwake results on the walls. 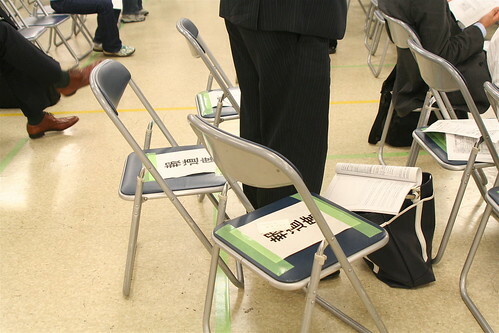 During the last Shiwake, there were criticisms that the press were getting tables (whereas others just have chairs) and some press people left their belongings to secure their seats but weren't sitting there. 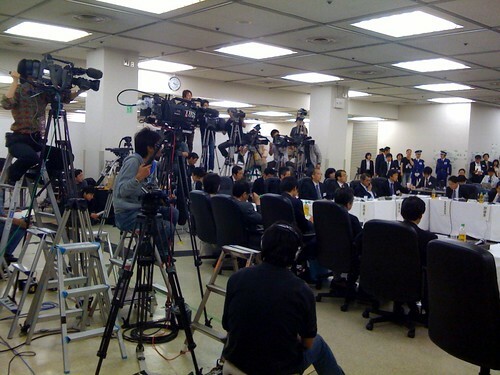 This time, press had a separate room where they have tables and chairs but can only watch Ustream and Nico Nico Nama Housou, and in the actual room for the Shiwake, they only had chairs just like other people. Screenshots from NicoNama- some people couldn't answer the questions from Shiwake-nin and are asking folks sitting behind them. Screenshot from Stickam. BTW, none of the streaming companies were paid by the government to do this live streaming, but they were allowed to put advertisements on their streams. So during the breaks, Stickam was actually putting various advertisements that they sold to their clients. Ustream was using the poll function. 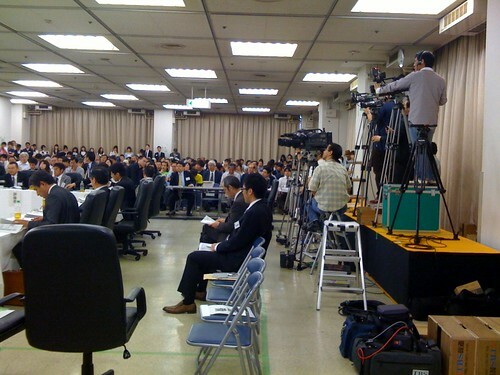 This is a screenshot of the question about the facility that was getting shiwake. The options are 1) I have used the facility 2) I have NOT used the facility 3) what the heck is that? 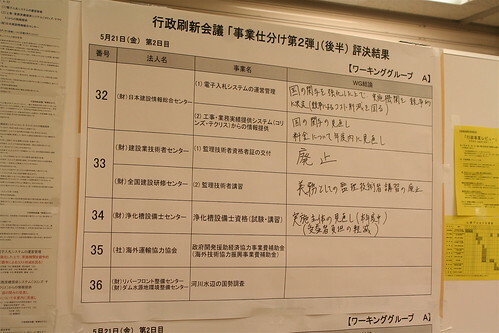 The next poll was which political party you plan to vote for the coming upper house election. Last month, I wrote a post about "Jigyo-Shiwake" in Japan. 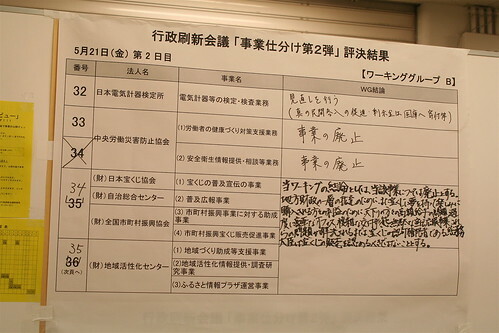 The next round of "Jigyo-Shiwake" will start tomorrow and will be held on 5/20,21, 24th and 25th. 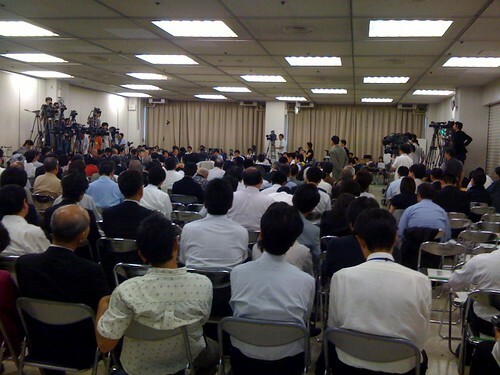 Today, I was asked to come to the upper house to discuss the possibility of tweeting in English about Jigyo-Shiwake. Unfortunately tomorrow I am packed with interview, meetings and event and it is impossible for me to watch shiwake and tweet. I can probably go to the venue on Friday so I will try to tweet on that day. If there is anyone who is able to watch live-streaming of Shiwake in Japanese and tweet in English, that would be awesome. Please use hashtag: #sasshin_e for English tweets on jigyo-shiwake. Personally, I will be tweeting from a separate account @fumitw from my usual account @fumi.